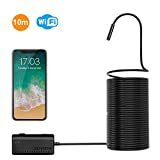 The Depstech WiFi Borescope Inspection Camera remains one of the hottest products the BGR Deals team has covered so far in 2018. We try to cover it every time it goes on sale because our readers absolutely love it. In fact, thousands upon thousands of you have bought them so far this year and we’ve gotten tons of great feedback from people who have found all sorts of great uses for this nifty wireless camera. Well, an Amazon lightning deal just dropped Depstech’s wildly popular camera to a new all-time low of just $29.59. Don’t feel too bad though, because it’s only $0.40 lower than the $29.99 sale price we typically see. Either way, it’s a great deal on a great product (that’s perfect for Father’s Day, by the way), so grab one while you can. The lightning deal lasts until 6:05 PM ET, or until it sells out.